Follow the old Ball Hut Road from the Blue Lakes car park along the moraine wall of the Tasman Glacier near Aoraki / Mount Cook. 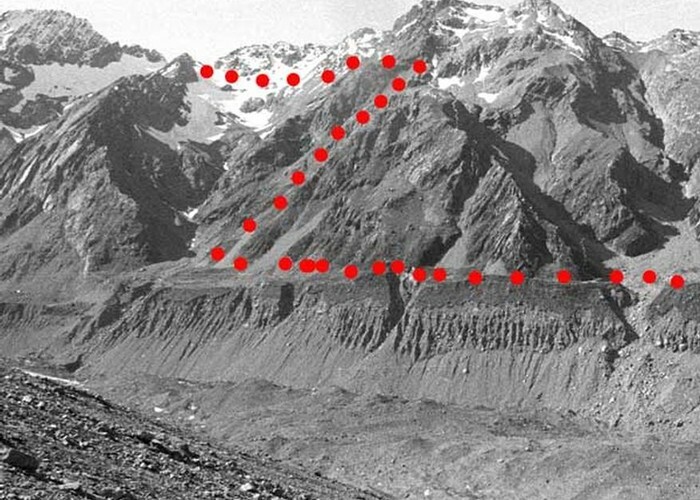 Although this track approaches Mount Cook, the peak is never visible. Ball pass route 1996 • By Sunny1. 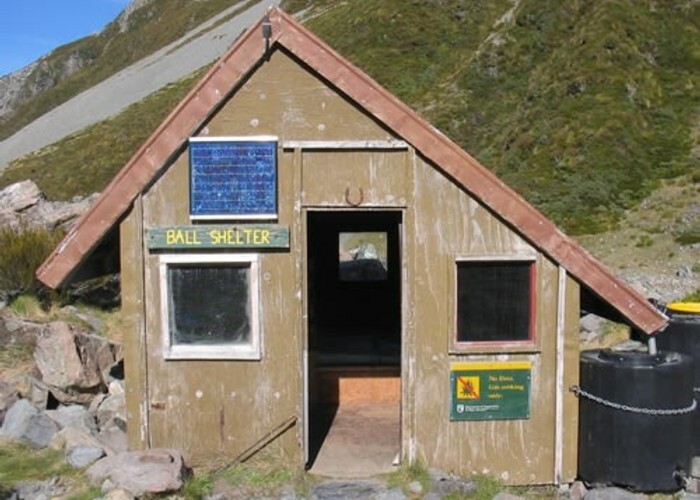 Licence: C.
Beginning at a road end shelter, a 4WD road heads north, hemmed between the Mount Cook Range on the left and a tall moraine wall on the right. A second car park is passed in about 30 minutes, which is currently accessible to regular cars. Ball Shelter Hut • By Delwyn. The Tasman Glacier and Lake are tantalisingly close but hidden. It is well worth clambering up the moraine at some point for the view. After almost 1.5 hours, the track climbs onto the moraine wall and the views open up to the north and east. From here, the track soon becomes a foot track, passing the major slips that saw the closure of the road to vehicles in the 1970s. The track cuts across grassy flats and small sections of scree before rejoining the road. The shelter is located near the bush on a large grassy clearing above a morraine wall. (ample camping here). Beyond here, a trail leads on to Ball Glacier. Continuing along the flats, the trail soon drops down the moraine wall in a series of steps right down to the level of the Tasman Glacier. The views of the Ball Glacier itself are very unremarkable. Much more common is hiking up Ball Ridge towards Caroline Hut. Added 11 October 2005 by MatthewMatthew. 4 revisions, most recently 8 January 2011 by glacier_fedglacier_fed. 656 views in the past year (55 per month).